The study investigated whether pacemaker checks could be used to identify patients with asymptomatic AF who could then be given anticoagulation for stroke prevention. Authors retrospectively included 223 patients who received a pacemaker during a five-year period and had not been diagnosed with AF prior to implantation. During follow up clinics a wand was placed over the pacemaker to collect information on battery life, and so on. The researchers examined the data on how many patents were currently experiencing AF, and how many people had episodes of AF but then returned to sinus rhythm. In patients found to have AF, the investigators calculated their stroke risk using the CHA2DS2-VASc score to see how many should be receiving anticoagulation to prevent stroke. The score gives points to the most common stroke risk factors (congestive heart failure, left ventricular dysfunction, hypertension, age, diabetes, stroke, vascular disease, female gender). ESC guidelines recommend that patients with AF and a score of 2 or more should be given oral anticoagulation to prevent stroke. During the follow up period, 36 patients had at least one episode of AF detected, of whom 27 had AF identified during a routine pacemaker check (12% of the study population). Just one-third of the 27 patients had received a pacemaker for sick sinus syndrome, while two-thirds had atrioventricular node block. All but one of the 27 patients needed anticoagulation to prevent stroke based on their CHA2DS2-VASc score. 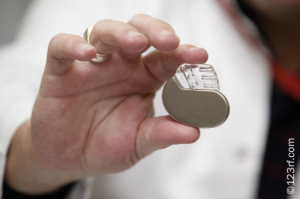 “The proportion of pacemaker patients with undiagnosed AF was higher than expected. Nearly all of them should have been receiving anticoagulation to prevent stroke. Pacemaker checks are simple to perform and our study shows that it is worthwhile using them to identify patients at risk,” Dr Denham added. “One-third of people with AF don’t know they have it so we need to use all of the tools available to recognise it. Our study suggests that pacemaker checks are a good way to identify new cases of AF so that anticoagulation can be started to prevent strokes,” he concluded.